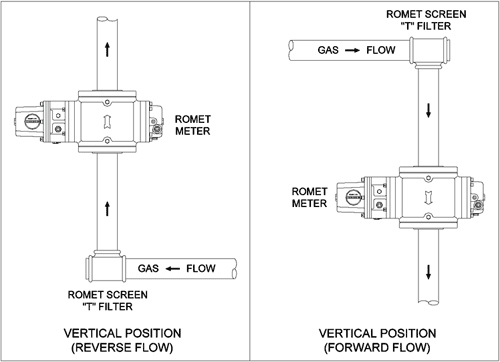 A Romet meter can be installed in either the vertical or horizontal position. However, the preferred orientation is the vertical (forward flow) position. In this position, accidental delivery of certain contaminants can be usually expelled more easily through the meter. The installation of a bypass line placed around a meter, whether temporary or permanent, will permit maintenance and/or servicing of a meter without disrupting the gas flow to the customer. This will help reduced certain costs and any inconveniences to the customer. If gas theft is a matter of concern, consideration should be given to installing locking valves, security seals and/or tamper proof exterior hardware. As a general rule of thumb, straight unrestricted piping should be maintained for a minimum distance of three pipe diameters on either side of the meter. 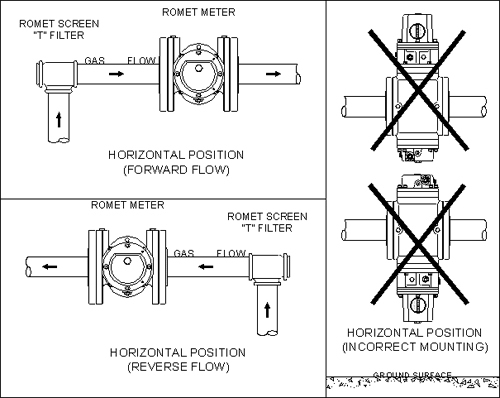 This practice should prevent any possible reduction in the meter accuracy due to turbulence and back pressure caused by other gas devices such as regulators, valves, filters, pipe elbows, etc..
Clearance space for the removal of batteries, meter module, or any other auxiliary device should be considered in the station design. At the very minimum, a strainer should be installed upstream from the meter to prevent accidental delivery of course contaminants (i.e. weld beads, pipe scale, stones, tap shavings, etc.) from entering the meter. A cartridge type filter is particularly important in protecting a meter when finer contaminants such as grit, pipe dust, valve grease, pipe paste, gum, moisture, etc. could cause meter damage. Generally speaking, natural gas is a mixture of hydrocarbons (methane gas being the main constituent) and noncombustible substance in a gaseous state. 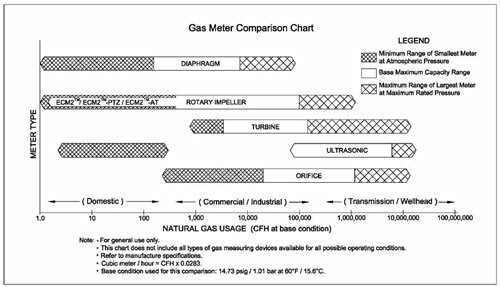 The amount of each component found in a gas mixture can significantly affect meter station operations including measurement. Water vapor for example when present in large amounts can produce highly acidic compounds that may be very corrosive to various parts of the meter station. Therefore, the cleaner the gas used (i.e. correct gas quality specified) the longer the metering device will operate correctly. The meter should be built and/or protected against adverse environmental conditions (both internal and/or external). Romet should be consulted before a Romet metering device is to be installed in such conditions. Non-lubricated valves are recommended upstream from the meter to prevent possible valve grease contamination which may slow or stop meter functions. If greasing of valves is required, the manufacturer’s recommended amount of grease should be applied (i.e. do not over grease). If the meter is operating at low pressure (<10 IWC or 22 mbar) and the load is shut off suddenly, downstream compression by the meter may occur. A sufficient length of pipe between the meter and the pilot load should be installed to provide a sufficient displaced volume. On application where a full load maybe turned on suddenly (not recommended), a restricting device should be installed downstream from the meter to prevent overspeeding and rapid pressurization of the meter. The restricting device should slow the gas flow to an acceptable flow and pressurization rate that will not exceed the meter’s rated capacity (Qmax). The following procedure can be used to calculate the specific gravity of a gas relative to that of air (1.00 at standard temperature and pressure). The example used is for natural gas (ng) of a fixed composition with no distillates. ** Note: Published values of the specific gravity of natural gas range from about 0.554 to about 0.87. Variation in natural gas composition by location accounts for the different values.